Check here for the latest reports from the department. On Feb. 6 at 8:45 a.m., patrols responded to the area of Route 38 and Larchmont Boulevard for the report of a motor vehicle crash. Patrols located the involved vehicles and began their investigation. The 22-year-old female driver from Deptford who caused the crash was determined to be under the influence of prescription medication which caused her to be impaired. She was subsequently arrested and charged with DUI as well as other motor vehicle violations. She was processed and released to a family member pending a future court date. On Feb. 5 at 9:11 p.m., patrols responded to a gym on the 4300 block of Dearborn Circle for the report of a wallet theft. The victim reported that he left his backpack unattended under a bench while he was playing basketball. When he returned to the backpack he observed it to be unzipped and his wallet missing. On Feb. 5 at 11:19 a.m., patrols responded to the 1600 block of Wharton Road for the report of a burglary. Upon arrival, officers spoke with a bank representative who advised that there has been an ongoing problem with suspects forcing entry into the residence and squatting there without payment. The squatters advised that they thought they signed a legitimate lease but none could be provided. The squatters were told to gather their belongings and leave the property. The 32-year-old male squatter from Mt Holly was found to have an outstanding criminal warrant out of Burlington Township Municipal Court. He was released on the warrant pending a future court date. On Feb. 5 at 9:21 a.m., patrols responded to a motel on the 1100 block of Route 73 for a disorderly person complaint. Upon arrival, patrols came into contact with a 28-year-old male from Lumberton who immediately consumed what appeared to be a white pill. There was a cut pen tube in the area where he consumed the pill containing a white powdery substance. The male was arrested and charged with possession of drug paraphernalia. He was released on a summons pending a future court date. On Feb. 4 at 2:23 p.m., patrols responded to Wegmans on Centerton Road for the report of a shoplifter in custody. The Loss Prevention Employee reported that a 28-year-old female from Newtown, Pa. was observed on video surveillance shoplifting $958.98 worth of store merchandise from the store. The female was located in the parking lot and subsequently arrested and charged on a summons with shoplifting. She had multiple criminal and traffic warrants and was turned over to Hightstown Police for one of the outstanding warrants. On Feb. 4 at 9:29 a.m., patrols responded to the ShopRite on Nixon Drive for the report of a shoplifter in custody. 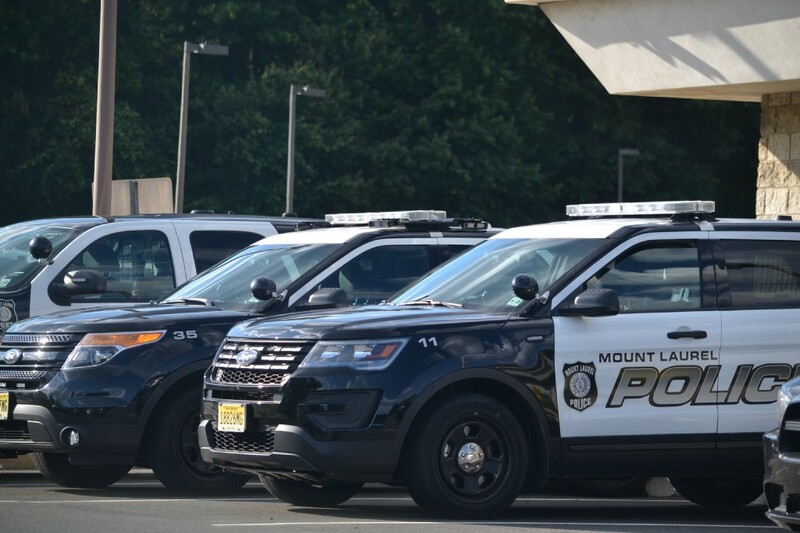 The Loss Prevention Employee reported that a 38-year-old female from Maple Shade was detained after shoplifting $13 in store merchandise. The female was arrested and charged with shoplifting. She was released on a summons pending a future court date. On Feb. 4 at 3:51 a.m., patrols, EMS and paramedics responded to a hotel on the 500 block of Fellowship Road for the report of an unconscious female. Responders located a 23-year-old female from Burlington unresponsive due to an apparent overdose on opioids. EMS administered Narcan and the female regained consciousness. She was transported to an area hospital for treatment. On Feb. 3 at 10:49 p.m., patrols conducted a motor vehicle stop on Route 73 in the area of Church Road. The investigation resulted in a 26-year-old male from Marlton being arrested for driving while intoxicated. His blood alcohol content was .19 percent. He was processed and charged with DWI and other motor vehicle violations. He was released to a family member pending a future court date. On Feb. 2 at 7:24 p.m., patrols responded to a residence on the 3100 block of Chadbury Road for the report of an open property. Upon arrival, patrols found that the property was forcibly entered by damaging the front door. It appeared that the property is vacant and that a squatter may have been staying in the residence at some point. On Feb. 2 at 7:03 p.m., patrols responded to the 1100 block of Route 73 for the report of an unconscious male in the parking lot. Patrols found a 34-year-old male from Brick lying unconscious next to his vehicle. Paramedics on scene administered Narcan and the male regained consciousness. The male admitted to driving his vehicle and being involved in a crash at an unknown location. The male suspect was charged with driving under the influence and transported to an area hospital for treatment. On Feb. 2 at 3:24 p.m., patrols responded to a car dealership on the 1300 block of Route 73 for the report of a vehicle theft. An employee reported that sometime between Jan. 25 and Feb. 2, an unknown suspect stole a 2017 Toyota Tacoma 4×4 from their parking lot. On Feb. 2 at 8:30 a.m., patrols responded to Red Cedar Court for the report of vandalism to a vehicle. The victim reported that someone slashed her vehicle tires while parked in front of her boyfriend’s residence. The time of damage occurred sometime between 10 p.m. on Feb. 1 and 5:45 a.m. on Feb. 2. The damage to the vehicle was estimated to be approximately $300. On Feb. 2 at 11:00 a.m., patrols conducted a motor vehicle stop on Route 73 in the area of the NJ Turnpike. Investigation of the driver led to the arrest of the 28-year-old female from Upper Darby, Pa. She was charged with possession of crack, heroin and possession of several pipes used to inhale drugs. She was also wanted out of multiple jurisdictions for outstanding traffic warrants. After processing, she was committed to the Burlington County Jail pending a future court date. On Feb. 1 at 5:11 p.m., patrols conducted a motor vehicle stop on Route 38 in the area of Midlantic Drive. The investigation resulted in a 31-year-old male from Barnegat being arrested for driving while intoxicated. His blood alcohol content was .15 percent. He was processed and charged with DWI and other motor vehicle violations. He was released to a family member pending a future court date. On Feb. 1 at 3:23 p.m., patrols responded to the 2600 block of Grammercy Way for the report of parts being stolen off of their vehicle. The victim/resident reports that over the past few weeks, an unknown suspect stole plastic accessory covers to her tow hitch, spare tire winch and front tow hook. The parts are valued at approximately $150. On Jan. 31 at 9:37 p.m., patrols observed a black Dodge Ram 1500 traveling at a high rate of speed on Route 73 in the area of Commerce Parkway. A short time later, the vehicle was reported to have been involved in a minor motor vehicle crash at the intersection of Church Road and Fellowship Road. The vehicle fled the scene after the crash. An officer checking the surrounding area located the vehicle at the dead end of Fellowship Road at which time the officer attempted to conduct a motor vehicle stop. The vehicle again fled the scene and was last observed on Church Road. On Jan. 31 at 1:20 p.m., patrols responded to a fast food restaurant on Centerton Road for the report of a credit card theft and use of the stolen credit card. The victim reported that she used her credit card at the drive thru on Jan. 30 and didn’t realize that she didn’t get her credit card back after the transaction. The victim was advised of suspicious transactions on the card after there were three fraudulent transactions totaling $229.71 and one attempted transaction. When the victim suspected the drive thru worker, video surveillance was obtained from the restaurant. The employee, a 46-year-old female from Willingboro was observed not giving the victim back her card and then later taking possession of the card. The suspect employee was arrested and admitted to stealing and making purchases with the card. She was charged with credit card theft, credit card fraud and impersonation. She was processed and committed to the Burlington County Jail pending a future court date.